Soda Pop Miniatures is showing off more preview cards for the upcoming Forgotten King expansion for Super Dungeon Explore. In deference to the season, it's all about Zombies. 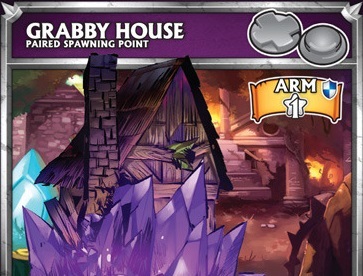 The Grabby House is a paired spawning point, and is much like other spawning points. There are two things to draw your attention to though. First, it has 4 hearts. All paired spawning points now have 4 hearts. This gives them a little more staying power, since they both take wounds when spawning. Second, Grabby Hands grants every monster with sapphire affinity (blue) within 2 squares the Grabby ability. 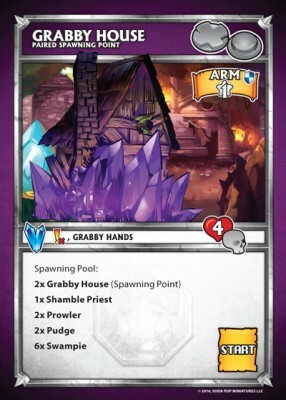 What is Grabby? Well it is the signature zombie ability, which makes it so that no enemy model can move while it is adjacent to a model with Grabby. That's right! Once a zombie grabs you, the Hero needs to chop it to bits before they can get away. Dirty!